I decided to have a go at this Twofer Card Challenge and if you follow the link to their blog you can see what this is all about and maybe have a go yourself. I hope I've interpreted the rules correctly. The theme is 'trees' and the idea to use the same stamp/stamp set or die/die set to make two cards for different occasions. There are some really imaginative ideas from the Design Team whereas mine seem to have turned out pretty simple but then I was aiming for a fairly CAS style here. (clean and simple). Both of the cards have to be submitted in one photo. 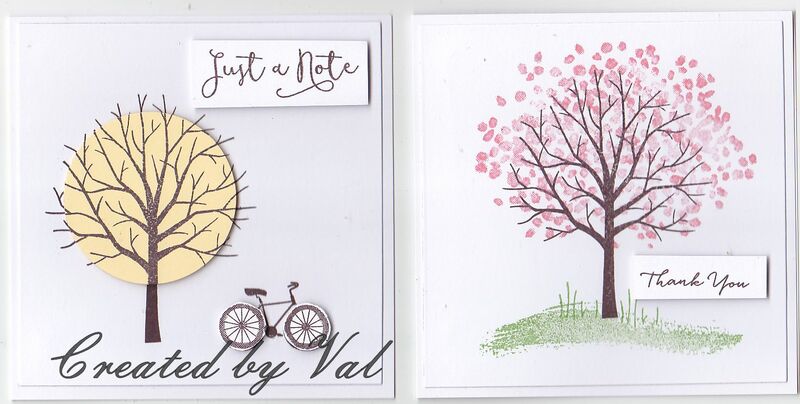 For one of them I stamped the bare tree and bicycle then stamped the branches onto a die cut circle and the wheels onto a scrap of card before cutting them out with scissors. These pieces were then popped into place with foam pads and a sentiment was stamped onto a strip of card and added in the same way. For the second card I added some blossoms to the tree and some grass underneath (all part of the stamp set). Again a simple sentiment was stamped onto a strip of card. Two fabulous cards .. .. I have had a tree stamp out for ages hoping to be able to play along! Oh for a few more hours in a day!! Sorry for being a bit of a stranger here .. .. things are just starting to calm down a little with Mum so hopefully I will be back on track again soon. I'd say you nailed the challenge quite well with these pretty trees! Both cards turned out really nice! Two wonderful cards, Val! I love the stamped circle with your tree and how you followed that through to the circles of the bicycle! Your blossoming tree is gorgeous - I want that tree in my backyard! Thanks for joining in the fun with us at the Twofer Card Challenge! Love this tree set and the cards you have created are fabulous! Great idea to pop up some elements on the first card and the tree in bloom with some grass looks so pretty on your Thank You card! Well done! 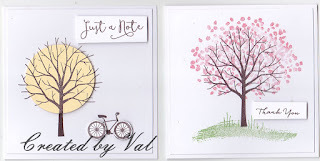 Two beautiful tree cards Val! LOVE the bare tree with the die-cut yellow circle background popped up ... adds lots of dimension. Very creative and fun. And love that sweet bicycle!! Your pink tree is so beautiful and elegant. Another wonderful design. Thanks for playing along with us at Twofer Card Challenge!